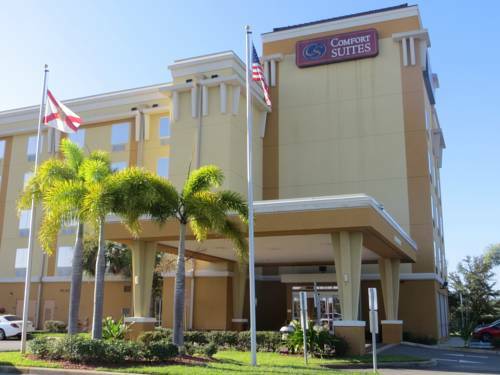 Behind every great day is a great night at the Comfort Suites Orlando Airport hotel in Orlando, FL. Our all-suites hotel is just minutes away from Universal Orlando with easy access to Walt Disney World and SeaWorld Orlando. Nearby destinations include Florida Mall, Orange County Convention Center, Fort Lauderdale Executive Airport and Orlando International Airport. We cater to families, tourists and business travelers with complimentary amenities that include free breakfast with healthy options, free WiFi, free airport shuttle, a fitness center, outdoor pool, guest laundry facilities, and a business center with fax. Each smoke-free guest suite features a hair dryer, coffee maker, desk, microwave, refrigerator, and recharge device. Also, earn rewards including free nights and gift cards with our Choice Privileges Rewards program. - Bob Carr Perm.Arts Ctr.